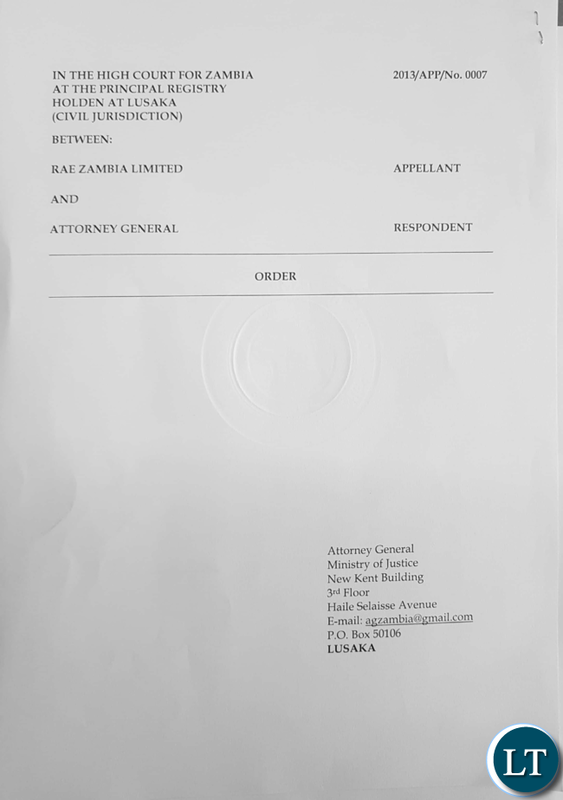 The Lusaka High Court has dismissed a restraining order it granted to RAE Zambia Limited preventing Tullow Zambia from conducting oil exploration works. According to a new court order obtained by Attorney General Likando Kalaluka, the injunction has been withdrawn. “Upon hearing Counsel for the Respondent and upon reading the affidavit of Francis Kondwelani Mwale filed into court in support of the application, it is hereby ordered and directed that the ex-parte order of interim injunction granted to the appellant herein on 8th August, 2017 be and is hereby discharged. Costs for this application are for the respondent,” read the court order. According to an earlier ex-parte court order seen, the inter partes hearing was set for August 25. “It is hereby ordered that Tullow Zambia BV by itself, servants, employee, agents, contractors or workmen, subsidiary or associated entity or otherwise is hereby strictly enjoined and restrained from undertaking or engaging in any petroleum exploration activities of whatever nature and description with respect to the area particularly and known as block 31 located in the Northern Province in the republic of Zambia,” read the court order, stamped August 8, 2017 and signed on August 10, 2017. It has emerged that President Edgar Lungu launched the Tullow Zambia Block 31 Oil and Gas Exploration in Kasama, against a court order restraining the UK firm from doing so. State House Spokesman Amos Chanda explained that there was something strange about the injunction, as neither the Attorney General nor State House were served with the court order before the launch was carried out. “The Attorney General has not been served with this order neither has Tullow [Zambia BV]. Tullow was informed by phone after the launch that a court order had been issue on 11 TH August,” said Mr. Chanda. This is what happens when corruption start from state house, How can state of be a place where contracts are sign, investors office, roads development office, nearly everything is now done from state house, what a country. In the UK EDF energy one of the biggest contracts in Europe to build nuclear power plant in the UK and no one has seen them at 10 downing street or the PM breaking ground. Tollow is not going to drill oil. There just going to put painted pegs of NO OIL, and government pay billions for such costs. I smell corruption here, earlier on State house was very furious with the injunction and threatened punishment. JUST AN ADVICE TO ALL UPND CHAPS: DO NOT BE AGAINST YOUR COUNTRY ALL THE TIMES. BE IN FAVOUR OF YOUR COUNTRY. DO NOT ALL THE TIMES WISH BAD THINGS TO YOUR COUNTRY. DIG DEEPER BEFORE YOU EXPOSE YOUR SADISTIC BEHAVIOUR: “There is a restraining court order against Tullow Zambia’s Oil and Gas Exploration-GEARS”. IN ANY CASE DO NOT RUSH TO MEDIA HOUSES UPON POUNCING ON INFORMATION YOU THINK AND WISH WILL BE INCRIMINATING. TAKE TIME TO INVESTIGATE. THE IMPERIALISTS NOWADAYS ARE OPERATING THROUGH NGOs. UNFORTUNATELY, THE NGOs DON’T EVEN KNOW THEIR BOUNDARIES- THEY FORGET THAT SOMETIMES THEY ARE ACTING AGAINST THEIR SPONSOR. ANYWAY, ALUTE CONTINUA. The power of khaki envelopes! Sharon U r very right. The discharge was done today, 14th August, 2017 so I believe Chipenzi can make a case that a court order was still violated and if he did not blow his whistle exploration would have taken place..that is why it is called BOMA ni BOMA, they can change anything to cover themselves and suit themselves. No doubt there must have been huge oversight from the advisors of the President and looks like today was a busy day for them. If this company is UK registered and there were serious irregularities let me warn the Directors that they will not get of lightly in England. As for this empty tin Lazy Lungu why was he in a rush to launch this project…if this Bum is lawyer he would have stayed clear unless he already knew the outcome from the courts. How is the prisoner from Mukobeko doing now in Chibokaila?? @ ? How would we know? That is from this mornings LT article…question is why could they not wait? Empty tin JJ emptying his small brain tin in public! I learned in school that an empty tin makes a lot of noise! It is an Under Five spirit. It runs in …! Hazaluza Hagain! Zambia is bigger than one regional party. #2 @Zebige, it often proves to be a curse because of mentality of people like you (all your clan). If it it were in another country you could be doing civil war by now. You think those guys who arm disgruntled elements like you are not watching? Ok tell us why chimpanzee would want this project stopped and what are the plans or intention of the complaints and how do they intend to use this piece of land. Is it simple politicking or something beneficial to the locals and Zambia in general. Thats what corruption at the highest level smells like. Was the State part of the court proceedings ? Was the State restrained from issuing a drilling licence ? Tullow was restrained from drilling but the State was not restrained from issuing a licence to anyone it deemed fit. Its not an act of corruption, its about armchair spectators making legal pronouncements without any idea of how the law works ! Chipenzi only pointed out an anormally (which has just been corrected at lightening speed) and yet some people want to make him look like he is against the country. This kind of thinking is becoming dangerous for our country. Why do some people feel they are more for the country than others? Why is there so much eagerness to exclude some compatriots? Some of you loud mouths have contributed zero to this country. Can you point to what you have contributed? Some of us can tell you what we have actually created for the common good of all Zambians. Fruits of Corruption (which include giving or accepting bribes or inappropriate gifts, double dealing, under-the-table transactions, manipulating …) Objectivity and common sense has become a rare commodity. Is this all you can day? Empty tin. Tullow Oil drilled in Ghana..found oil,drilled in Uganda…found oil ,drilled in Kenya …found oil,drilled in Zambia …found controversy & fuzzy laws. This a case of a corrupt company influencing both the executive branch and judiciary. We are now a confirm banana republic, where white swindlers can came a do as they wish as long as they gease someone’s sleeves. UPNDonks…..kikikiki….is that the new name for Donkeys? A short cut maybe? Watch out Zambia! There is a breakout of Diphtheria in South Africa. Keep an eye on passengers from Cape Town. Mwikebati tatwamyebele. 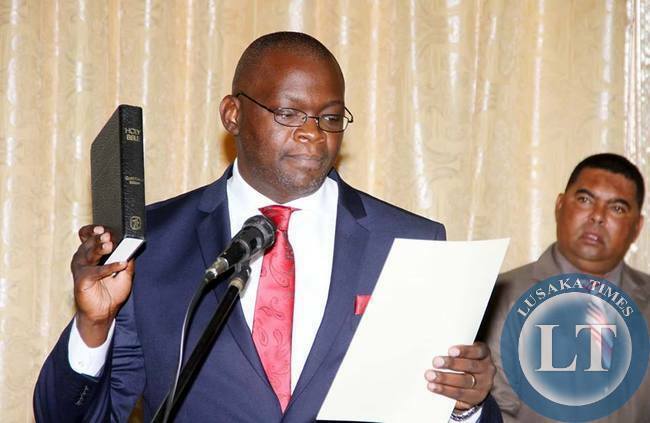 It is clearly stated that as quoted in the article that “State House Spokesman Amos Chanda explained that there was something strange about the injunction, as neither the Attorney General nor State House were served with the court order before the launch was carried out. So this means there is nothing to start blaming the government of the day. Let Tullow continue with the exploration in Luapula & Northern provinces please, it is high time these areas have big companies as well. …NO WONDER THEY ALWAYS LOSE!!! Cowards! Do these fools think that Lungu will rule and live forever? Let the prospecting start. We need all the cylinders of the economy to be firing. As long as they are not using our tax kwachas to prospect, let them proceed. When the dollars start rolling-in we shall get our share of taxes while the capitalists take the bulk of the profits to their home countries. The trickle effects will be valuable to the whole country. Poverty will reduce, though not significantly but anything that positively impacts our GDP is a good thing. All the nay sayers need to start seeing the silver lining in the clouds. And for the ruling party sympathisers, you need to be objective and critical in your approach to issues of national interest. I just wonder weather Chipenzi thought he was going to win his war or he was overtaken by emotions , that the two provinces he hates with passion will finally have something to talk about , yes there is oil in the north and luapula provinces . However the two provinces are all zambian which means you can work any where in zambia if you are a zambian , what only surprises me is how fast he acted and over looked a lot of facts that go with the case in point , he didnt even consider that the president has executive powers on such issues. I dont know if ever he recognises the president of the republic or he is acting for foreign powers which woudnt want zambia to develop. @HaLombe #22, who do you think will be the next president in your delusional dreams? @24, they are all Under Fives and very small in thinking. Aagain my post removed, tullow is 100% uk owned a d is only doing geologica studiesi and 2d mapping on its allocation in zambia which js focused on the zambian sides of lake mweru, lake mweru snd lake tsnkanyika. We need strong environmental safeguards. If they drill and pollute those lakes can we eat oil instead of fish.